How Can You Replace A Water Main By Yourself? Perhaps the water pressure in your house isn’t great or your water supply isn’t healthy. 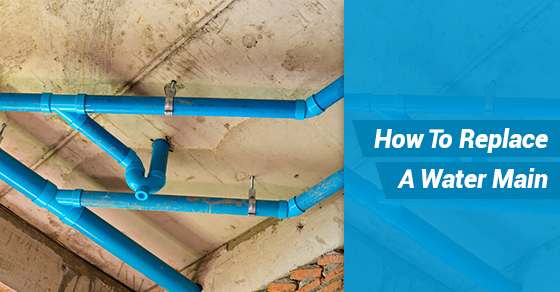 If you find yourself in either of these situations, know that it is possible to replace a water main – the main pipe that supplies your water – entirely by yourself. You can also save yourself a lot of money in the process. Here is how to do it. A Graft Spade. A graft spade is a slimmer and longer version of a normal spade. While a normal spade could still be used for this task, you will save yourself a lot of time and energy with a graft spade. Pipe (25mm Blue Plastic). If your ground conditions are considered normal, this is the type of pipe you will need. Ensure that your pipe comes with stoppers. Expanding Foam Filler and Bubble Wrap. This will be used to seal the ducts. Expanding foam filler will be used to go around the duct while bubble wrap will be used for the inside of the duct. Builders Sand. This will be used to line the inside of the trench. Connectors and Pipe Sleeves. You will need a 15mm to 25mm adaptor to connect your new pipe to the current pipe in your house. Optional: Plastic Stop Tap. You can save yourself a bit of money but simply reusing your old stop tap. However, if it is old and damaged (for example, it leaks) it is best to replace it. Locate your current water supply pipe as well as any other lines, including those for gas, electricity and your TV. Ensure that your new replacement pipe is at least 350 mm away from them. Dig the outside trench. Make it a narrow one that extends from from the front of your house to the end of your property. Ensure that it is at least 750 mm deep to avoid the pipe becoming damaged due to frost. Locate the spot where your current water supply enters the house. Simply make this hole a bit larger by digging. Push the Ducting Through this Hole. You can leave the current supply pipe next to it. Fill in the Gaps Around the Ducting. This is when you will use your expanding foam filler. Use this to fill in the gap on the outside and inside of the wall. Seal your Pipe. Use the stoppers and tape for this task. They will prevent any dirt from entering it. Place Builders Sand at Bottom of Trench. This will serve as protection for your pipe. Place the New Supply Pipe. Place the new supply pipe up to the edge of where your property ends. This will involve some pushing. Ensure that you have at least 1 m of pipe at the edge of your property so that the pipe can connect to the main water supply. Insulate the Pipe Under Your House. Seal the Opening Around The Pipe. Simply take bubble wrap and push it into the duct. At this point, you simply have to wait for the utility company to inspect and mark your project as acceptable. Next, contact a plumber to come and remove the old pipe and connect the stop tap to your pipe. The utility company will then connect your water pipe to the main water supply. If you are in need of a plumber, contact our team of plumbing experts at Brothers Plumbing today. We have over 50 years in the business and a superior track record in the industry. We offer competitive rates, upfront quotes and 7-7-7 [not sure about triple 7s??? }service.